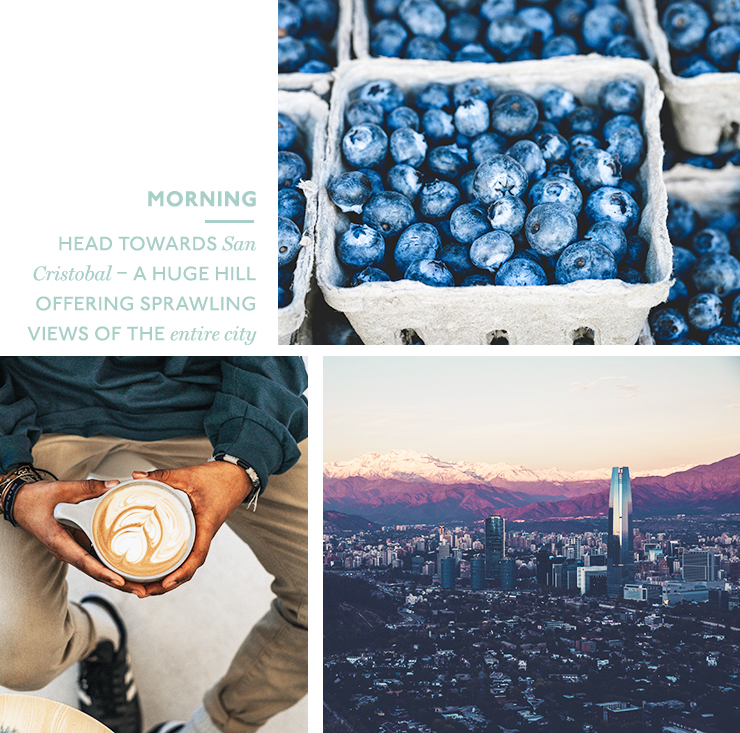 The capital of Chile boasts some of the best food, wine and art you’ll come across. So pack your bags for 48 hours in Santiago. Start your day the right way with a coffee. Despite being in South America, good coffee is actually hard to come by in Chile given the country doesn’t produce its own coffee beans. Don’t let that dishearten you though, you’ll just need to search a little harder. Cafe Del 10 in the centre of the city does a good brew, as do any of the cafes in the hip neighbourhood, Barrio Lastarria. Breakfast will usually involve a pastry of some sort in Santiago, so why not head to the place touted as having the best empanadas in the city? (For those playing at home, an empanada is a baked pastry filled with loads of different yummy things—chicken, beef, cheese, mushrooms. You choose which sort you want.) Emporio Zuccino have locals lining up each and every day for one of their famous empanadas, so you know they’re good and one will only set back $2. After your breakfast of champions, head towards San Cristobal—a huge hill offering sprawling views of the entire city. If you’ve got appropriate closed in footwear, you can make the 40-min climb up the hill. If not, buses and cable cars can take you up. Descend the hill and set your sights on Vega Mercado. This bustling fresh produce market has loads of cheap fruit and veg, get yourself a snack to munch on while you wander around. Half a kilo of blueberries will only set you back $2. That’s the cheapest antioxidant hit you’ll ever find. It’s lunchtime, and you have options aplenty. You can wander across the road into Vega Mercado’s little-sister market, Vega Chica, where you’ll find loads of little eateries providing traditional Chilean lunch for under $5. Or if seafood is what your heart desires, cross the river to Mercado Centrale, which offers a mix of fish market stalls and seafood restaurants. Just make sure you stick to the eateries on the periphery of the market rather than the centre, as these are cheaper and less likely to sting you with ‘tourist prices’. Meander across to the neighbourhood Barrio Bellavista for a fun night out. The street Pio Nono is lined with bars and pubs—and nothing else—so take a stroll down there and see what tickles your fancy. The pub Riggo’s has all-day happy hour with a litre of beer costing just $4, two pisco sours for $9 and local street buskers playing Latin music. Handy tip: the bars and clubs get more hectic the further north long Pio Nono you go. Start your day with some culture by visiting Santiago’s impressive art museums. The Museum of Fine Art and the Contemporary Art Museum both have free entry. 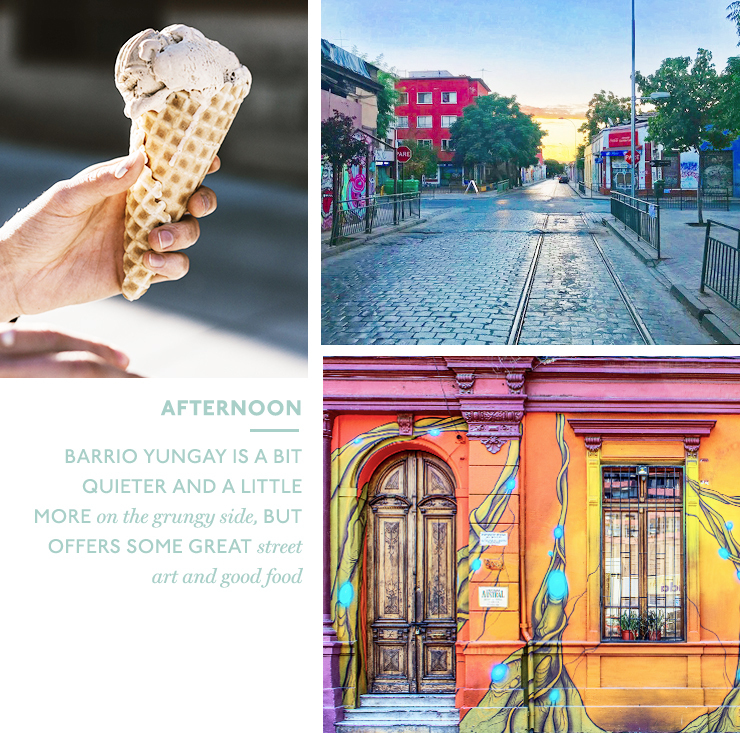 Once you’ve got your art fix, head to the trendy Barrio Lastarria for the best ice cream in the city. Given the strong Italian influence in Santiago, there is a lot of gelato around, and Lastarria’s La Rosa is allegedly the best. Take a walk up to Bocanoriz (which translates to nose and mouth in Spanish, in case you were wondering) a beautiful little wine bar in the heart of Lastarria. This place boasts 349 Chilean wines and offers a variety of different wine flights for a mere $12. Spend the afternoon enjoying the Chilean wine and people watching on the street. Jump on the Metro (or walk if you’re feeling energetic) to Barrio Yungay. This neighbourhood is a bit quieter and a little more on the grungy side, but offers some great street art and good food. Head to Ciudad Vieja or Fuente Mardoqueo for one of the best sandwiches in the city. (If there is one thing the Chileans love, it’s their sandwiches—and these ones are top notch.) Think amazing cured meats and tasty cheese all piled in to a crunchy bread roll. To work off that sambo, spend the rest of the afternoon walking through the colourful streets of Yungai admiring the street art. Set your sights on Cerveceria Nacionale—a small bar in Yungai serving boutique beers only from Chile. The selection is enormous and the staff behind the bar will be only too happy to recommend you some favourites. For the non-beer drinkers, Cerveceria Nacionale also serves a truly traditional pisco sour. Once you’ve worked up an appetite talking beer with the team, order one of their delicious home-made pizzas for dinner. Don’t be put off by the fact that Chileans are making you pizza—as mentioned, the Italian influence runs deep throughout Santiago, and these guys will dish up a pizza as good as any Italian. Heading to Colombia on your travels? Here's how to have the best 48 hours ever in Medellin.